Zombie Master (ZM for short) is not your average zombie mod. In fact, it’s not your average mod in general. It’s almost like a sort of God Mod mixed with a Survivalist Mod. It really is very different, and at the same time very familiar. Since mods are just re-skins, you do get the feeling you’ve met these so called “new zombies” before. I’ll break down the game really quick though, starting with the humans. HUMANS: The humans start out in an specific area on whatever map is selected. This is obviously the spawn point, but it doesn’t work like most spawn points. You only spawn once and that’s it, no more. This adds to the thrill of the game when you’re running from zombies. It feels like a survival horror game. It feels like a zombie apocolypse. It feels real. You choose from a variety of survivor skins, which really are just Half-Life 2: Deathmatch skins remade. However, it does provide variety, and that’s lacking in some mods, especially zombie apoc’ mods. The humans have a small, but useful and balanced set of weapons. You can use the rifle, the most accurate weapon in the game, which can hold a small amount of ammo. Or you can try out the Mac 10, the strongest weapon in the game. It is, however, quite the ammo drain so you need to be conservative with it. Or you can use the shotgun, which is loaded with ammo, and although it’s the weakest weapon, it can still provide a good defense against the undead. Then there’s the revolver, which works much like the Half-Life 2 revolver, meaning: one shot, one kill. I believe there’s even a molotov, though I myself have never used one. At least I think I’ve never used one. Ah well, there’s always the exploding barrels. Speaking of which, when playing as the humans, you definitely need to use strategy, since you aren’t just fighting a couple of player zombies, but a horde of them. There’s two gametypes the humans can play through: ojective style and survival style. Ojective style maps contain specific spots where you have to go to complete the mission. Simple enough, right? Well, so is survival style. You basically have to survive as long as you can, barracading doors and dropping barrels on enemies. It’s fun, and when you play with friends it’s a real blast. THE ZOMBIE MASTER: Now, there’s one player who’s pulling the strings here. Setting traps for you, and spawning NPC zombies at key point son the map. The Master must also use tactis to defeat the players in an RTS style gameplay format. He also creates a real horror film feel for the game, by making you feel like around every corner there may be another zombie. It can be very fun to play as the Master on some maps, very fun indeed. 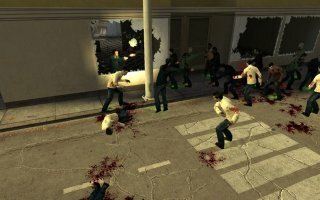 THE ZOMBIE HORDE: The zombie horde is composed of several types of creatures. The shambler is the classic zombie form the old days, when they didn’t run around like rabid wolves through the night, or like really fast chickens. They just move around very slowly and groan. But don’t let their speed fool you. If a horde of them gathers around you, they can tale you out pretty fast. Then there’s the banshee. It’s not a screaming chick though, it’s more of a hunter type zombie, one of the fast ones. It’s a re-skin of the fast zombies from Half-Life 2, so if you’ve played that, you can handle these guys. They’re fast, they’re tough, but they don’t have that much health so you sould be able to take them out easily, if you’re quick. There’s also the hulk, who’s a brute of a zombie, large bulky and slightly faster than the shambler. They’re mostly dangerous when you’re in a dark room since they like to attack from behind, so watch out. There’s also the drifters, limbless, floating zombies that, when they get close enough to you, screw up your vision and drain your health. And they make a great team with their exploding skeleton allies, the immolators (forgive me if I spelled that wrong). They walk around, usually alongside drifters (if the Master is smart, since a drifter can screw with a guy while the immolator strikes), and explode when you get near them. Pretty freaky dudes. Overall, ZM is a great mod. I recommend it to all zombie haters who need an outlet for venting. You can get it from Steam, or just google “Zombie Master mod” and it should turn up. Grab a gun, and go kill some zombies. WARNING: You have to own Half-Life 2 to play ZM.